Our site designs strive to increase and diversify audiences while lengthening their stay at cultural heritage centers, libraries, museums, performing and fine arts institutions, zoos and aquaria. We design these spaces to complement the caliber of the institution, while strengthening their messages. Through its relationship with the Missouri Botanical Garden and with Terra's guidance, Lewis and Clark Community College has created a campus distinguished by beautiful buildings, display gardens, and a major collection of outdoor sculpture. The Monticello Sculpture Gardens feature twelve original commissions and acquisitions. As site designers, Terra has been responsible for thematic coherence, sculpture siting, landscape design, and consultation on specialty lighting. The sculpture placement has considered not only the viewing experience of each piece, but the creation and preservation of the surrounding viewsheds of the campus. The College’s collection of bronze sculpture by nationally renowned artists has developed thematically hand-in-hand with the creation of its Missouri Botanical Garden’s Signature Garden plantings. The gardens at the Campus core relate the student’s experience to the Voyage of Discovery by Lewis and Clark, a theme which is expressed by Richard Hunt’s group of seven monumental works, "Crossroads" (pictured center). The core gardens are also enriched by "White Cedar" by Deborah Butterfield (pictured left), and “Sacagawea” by Glenna Goodacre. “Spirit of Survival” by Ruth Duckworth, and an acquisition by Magdalena Abakanowicz (pictured right) grace contemplative gardens near campus ponds. Other gardens anchor works by John Medwedeff, Joel Perlman, and Peter Fagan. Most recently, Terra assisted in siting and preparing site plans for an acquisition by Stephen DeStaebler in the Godfrey Bosque, the campus’ major vehicular and pedestrian portal. Locations throughout the campus have been reserved for future environmental art installations and iconic entrance pieces. The Nutcracker (Winter 2011): Guests were transported back to the late 19th century as the Conservatory rooms were magically transformed into key scenes from the beloved tale. 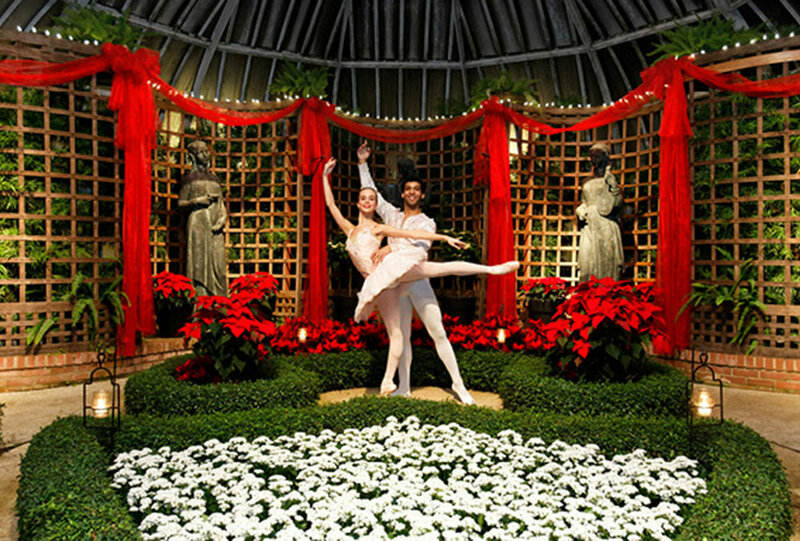 The Nutcracker show was also graced with vignette performances by the Pittsburgh Ballet Theatre. Walking in a Winter Wonderland (Winter 2014): Snowmen topiary guided visitors on a journey through whimsical plant and prop arrangements inspired by imagery from the verses in this well-known holiday carol. Deck the Halls (Winter 2015): The Conservatory rooms were lavishly decorated with boughs of holly and Victorian-era elements, and refreshed with modern translations of this timeless carol’s traditional meanings. Snow Day (Winter 2016): Adults and children alike delighted in playful vignettes of the fun that can be had on an unexpected day off, where snowball fights exhilarate and blanket forts rejuvenate. Holiday Magic (Winter 2017): Each room reflects a different aspect that makes the holiday season special. Vignettes include a winter feast, Santa’s workshop, a New Year’s Eve celebration and the Gift of Giving, a display that celebrates the idea that giving without expecting anything in return is something truly magical. In 2011 Terra teamed with architects Pfaffmann + Associates to develop a Master Plan for the renovation of the historic Beaver Station into a cultural and events center. Working collaboratively with the Directors of the Beaver Area Heritage Foundation, Terra and Pfaffmann prepared plans to completely restore the historic structure and transform the grounds into an exciting, celebratory experience for the Center’s guests. Terra’s site plans paid homage to historic and contextual cues of the station, including restoring the original circulation and arrival sequence of the coaches and carriages (updated to accommodate modern vehicles, of course), improving the parking circulation, access, and capacity, creating an event patio and event lawn to offer a variety of rental spaces and help increase guest capacity, and planning for a historic walking trail that interpreted key moments in Beaver-area history. After the historic preservation and renovation work was completed on the Station, Terra was commissioned to prepared detailed landscape plans for the track-side Event Patio (2015) and the Event Lawn and Gardens (2016), to seat the beautifully renovated Station in a welcoming garden environment and increase guest capacity for the various events. Terra performed construction administration services and provided peer review of the repurposing of a historic belvedere into a modern-day event pavilion. Open to the public in the fall of 2015, this award-winning station is now host to more than 8,800 visitors a year, for events ranging from public art classes to non-profit fundraisers to wedding receptions and other family celebrations. Carnegie Museum of Art expanded their contemporary art exhibits outdoors in anticipation of the 2013 Carnegie International with the Lozziwurm, a colorful and tubular sculpture designed by Yvan Pestolozzi in 1972. A popular feature of western European playgrounds for many decades, this is the first Lozziwurm installed in the United States. Terra prepared a campus-wide Master Plan for the Carnegie Museums of Pittsburgh in 2012, and were retained for full design services for the Lozziwurm Garden, assisting museum curators to contextually site the sculpture and create a garden space to welcome children and families. The Lozziwurm Garden also completes an important goal of the Master Plan by creating a more open, vibrant and welcoming environment at the entrance to the Museum of Art. The installation is part of The Playground Project, through the 2013 Carnegie International, which presents outstanding and influential playgrounds from the mid-to-late 20th century from around the world in order to open discussion about the way modern-day playgrounds are designed and utilized, particularly regarding how we approach childhood, risk, public space, and education. The Lozziwurm Garden is now a permanent fixture at the museum, free of charge during museum hours. The Jacksonville Zoo and Gardens is embarking on a botanical journey like no other zoological institution in this country, developing a separate yet integrated botanical garden at the Zoo. The Master Plan, led by Cindy Tyler while a partner with MTR, designates three garden zones within the Zoo: the Garden Path, a major linear garden display featuring Florida flora; themed Pocket Gardens which serve as botanical forecourts to animal exhibits; and the ten-acre Trout River Gardens, comprising themed display gardens with spectacular views of the tidal river - a perfect culmination of a garden visitor’s journey. Subsequently, under the direction of Terra Design Studios, the Zoo has opened several gardens from the Master Plan. The Rivers of Color, African-Savanna Blooms Garden, the Asian Bamboo Garden, and the Hanging Gardens at Trout River Plaza have quickly become favorite gathering spots and wedding and event sites for the community. Terra’s goal for the Zoo and Gardens has been to enrich the family experience by creating sensory excitement and opportunities to play and discover in horticulturally rich settings, aided by interactive exhibits, water features, and commissioned art pieces to create a magical experience for young visitors. The Jacksonville Zoo and Gardens is the most visited tourist attraction in the area, with an average of a million visitors per year. The Gardens, honored with the Florida ASLA Award of Merit, have improved the Zoo's brand and increased attendance.